Holy crap! 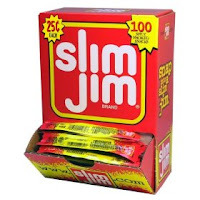 There's a catastrophic Slim Jim shortage forecast for the rest of the summer. Now what the hell am I going to snap into? In not-quite-related news, Oscar Mayer died. Now, I'm a fan of bologna-related humor as much as the next guy, but did the Los Angeles Times' obituary really have to start with "His bologna had a first name. His bologna had a last name. So did he." and end with "No word on whether the funeral procession will be led by the Wienermobile" ? made the beef jerky treat in early June. appears to have been caused by a gas leak. gas leak at a slim jim factory?